The cast of Sahara , including Rex Ingram. 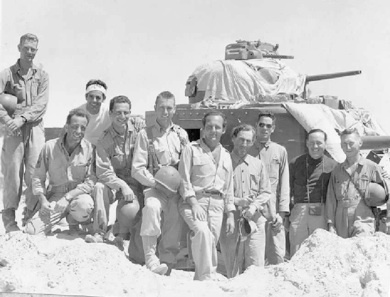 In the picture above the title we have Humphrey Bogart in Sahara , while the picture to the left we have Bogie with some of the Army guys that served as extras on the picture. Notice anything different about the two pictures? In the first picture we’ve got Bogie, and we’ve got Rex Ingram. You may not recognize him, but he’s the black actor in the picture. He was in Vincente Minelli’s first picture, Cabin in the Sky , a wonderful picture that I heartily recommend. Sahara tells the story of an American tank crew that is serving with the Brits around the time of El Alamein. They are ordered to retreat, and they are in the search for water. Now a lot of war movies of this era had a “we’re all in this together no matter who we were before” theme. So you had people of all classes serving in the unit, the platoon or company, that was being shown. A tank has room for 3 or 4 guys, and the Army wasn’t integrated, so the producers had to get a full roster together. The tank meets up with a group of Brits, among them a doctor, and a printer. The printer serves as the intellectual in the group. They also get an Italian prisoner of war, so they’ve got part of the ethnic group back home. 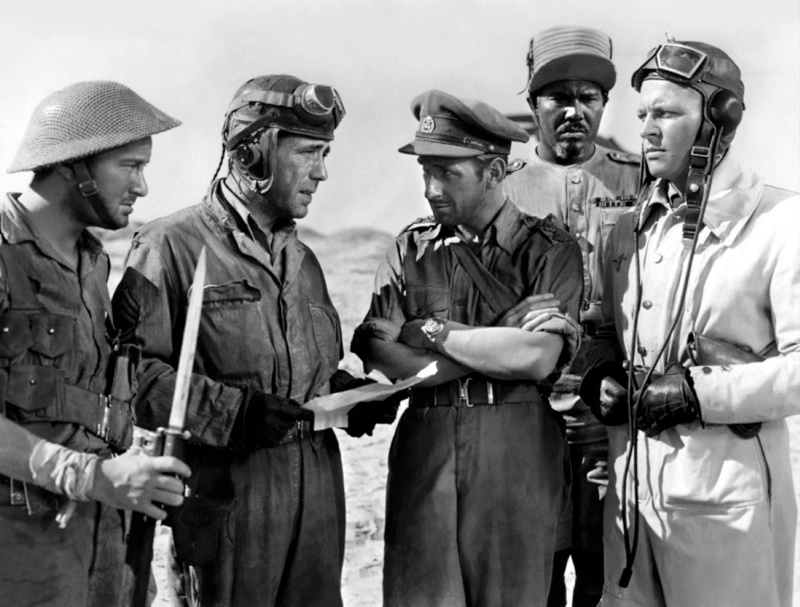 They also meet up with Rex Ingram, who is supposed to be a Sudanese soldier, so he’s got a British accent, and also helps integrate the unit. The unit thus acquires the characteristics of America. The unit and its associated members capture a German prisoner, and this brings an opportunity for all of the members, including the Italian prisoner, to take rhetorical, and in some cases literal, punches at the German. The fascist ideology is reviled and condemned by all parties. Now that may make it sound like a bad movie, but it’s actually a very good movie, and I think Bogie ranked it as one of his favorites. The bringing together of the characters may sound silly, but I think that given the constraints of the plot it was done fairly well. Bogie is tough and smart, and for once doesn’t die at the end.